coupled with crooked politicians has pushed DAN over the edge. back to 1920; rural Michigan, a farm whose innocence has been stricken by drought,and a father whose demons have followed him home from World War I. When CLAIRE’S family inherits a donkey won by her at a county fair, things begin to change for them. Nightmares are replaced, silos are filled, and people are healed. Or are they? It isn’t long before CLAIRE’S family understands there is more to this animal than meets the eye. From the donkey’s mysterious concern for WILSON WASHINGTON, the only black farmer in the area, to his compulsive attraction to a statue of Christ, CLAIRE comes to believe the donkey was sent by God. 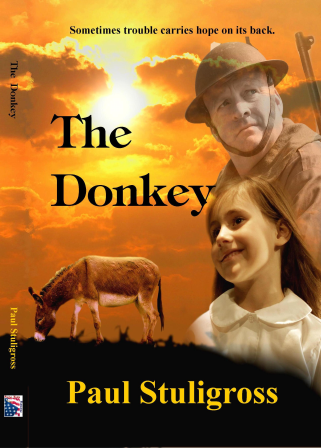 Finally, when her father JOHN investigates, he comes face to face with the possibility the donkey was once ridden by CHRIST. THE DONKEY is a story about hope and redemption in the midst of two worlds, a century apart, yet both similarly laden in darkness. As DAN relives CLAIRE’S story he is faced with the realization that he must become part of it; and that sometimes trouble carries hope on its back.